Three sailors are planning on walking 180 miles to raise money for Armed Forces charity Help for Heroes. Chief Petty Officers Andy 'Gibbo' Gibbs and Philip 'Knocker' White, both of whom serve at HMS Collingwood, and James Cameron-Wood, a member of Black Rods Staff at the House of Lords, are to walk the journey from between the sticks at Twickenham to between the sticks at the Principality Stadium in Cardiff. The trio will carry the Gilbert match ball for the Wales vs England RBS Six Nations fixture on February 11th next year. 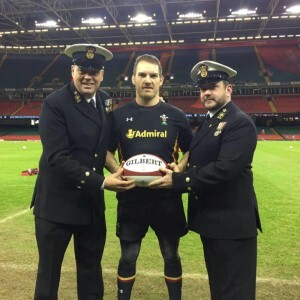 Andy and Philip were presented with the Gilbert ball at the Millennium Stadium by Wales captain Gethin Jenkins in preparation for the journey. A spokesperson from the Welsh Rugby Union said: "The WRU are proud to once again be supporting Help for Heroes and Gibbo, Knocker and JC on the walk from London to Cardiff in 2017 for the RBS Six Nations fixture. The walk is a tremendous effort for a great cause. We wish them luck and look forward to welcoming them back to Cardiff in February, and hope they look after the ball for us." The trio, who will be aided in their effort by Georgina Crumpton, co-founder of the Doing it for Heroes team, and Penny Harris, part of the charity's team. The journey will be split up over seven days, with the team starting out on February 3rd. From Twickenham, they will walk to Reading and then onto Hungerford, Cirencester, Gloucester, Monmouth and Newport. The final part of the journey will have them arriving into Cardiff at 11am on February 10th. Over the last seven years, the Doing it for Heroes team have managed to raise more than £477,000 for Help for Heroes, providing aid and support for a huge number of individuals. The team is being sponsored by Heineken UK, Crabbies UK, Gilbert Rugby and Essex Auto Group.